Hello stampers! Today, I am sharing a sneak peek of the upcoming stamp set, Enjoy Life. This is one of the Million Dollar Achievers stamp sets designed by Connie Fitzgerald. I love the inspirational sentiments in this set. I can sit and create with this set forever. For my card, I thought it would be fun to do some water coloring. 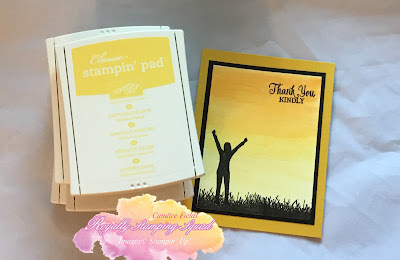 I got three of my yellow ink pads and Pumpkin Pie to create sunset background.